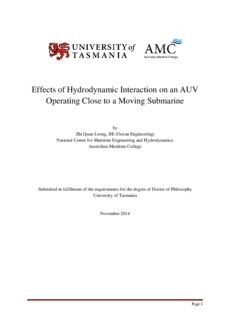 The work detailed in this thesis investigates the behaviour of the hydrodynamic interaction effects acting on an unappended AUV manoeuvring in proximity to a larger moving underwater vehicle such as a submarine. The investigation examined the steady-state and transient interaction effects on the hydrodynamic coefficients of the AUV as a function of the relative: speed, longitudinal position, lateral position, and size between the two submerged vehicles. The work involved extensive development of Computational Fluid Dynamics (CFD) models to simulate the manoeuvres in order to map the interaction behaviour. Experimental Fluid Dynamics (EFD) involving captive-model tests of the two vehicles were carried out to validate and supplement the CFD data. The results show that the hydrodynamic interaction acts to attract and repel the AUV at the stern and bow regions around the submarine, respectively. The magnitude of these attraction and repulsion interaction effects varied significantly due to small changes in the relative longitudinal position, suggesting the need of an accurate and fast responsive control system for the AUV to adequately maintain its trajectory around the submarine. These adverse interaction effects were found to be minimal around amidships of the moving submarine, suggesting a safe path for the AUV to approach or depart the submarine laterally within that region. In addition, the interaction effects on the hydrodynamic coefficients of the AUV were shown to reduce as the relative speed of the latter increased. Due to the need to simulate large relative motions between the two vehicles, this thesis also investigate and identifies the merits of two dynamic mesh techniques within ANSYS CFX (i.e. Immersed Solids, and AMP Re-Meshing) to simulate multiple bodies in relative motion. Although the numerical models behind the techniques have undergone substantial development in recent years, as they are beta-features in ANSYS CFX there are currently no existing studies demonstrating their capabilities in modelling multiple bodies in relative motion. The developed CFD simulation models are suitable for future work involving appended AUVs and the coupling with a control system for manoeuvring simulations of multiple underwater vehicles.